Steven (Chicagoland, United States) on 16 May 2011 in Cityscape & Urban and Portfolio. With the help of a late afternoon sun, a rainbow of colors brighten the cityscape of Chicago with these tulips in full bloom at Millenium Park on Michigan Avenue. 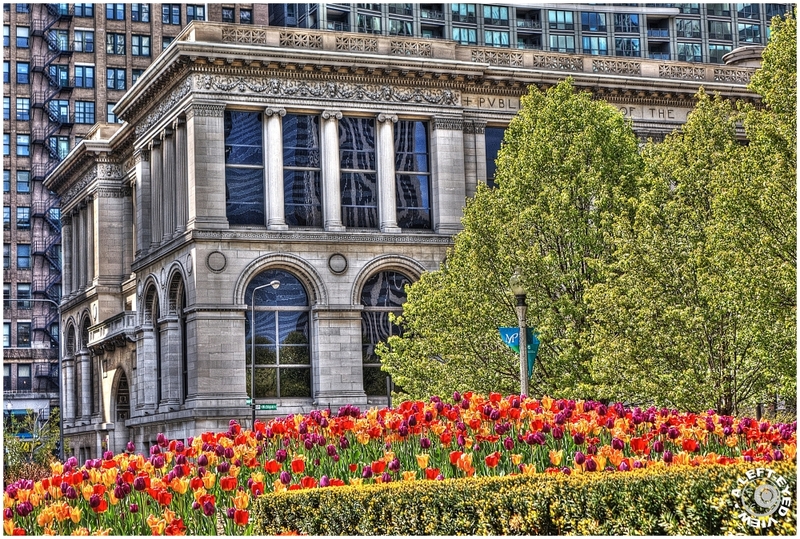 The Chicago Cultural Center, formerly the main branch of the Chicago Public Library, serves as a nice backdrop. The detail seen in the Cultural Center's entablature really caught my eye. A real work of art. Very nice effect and processing. Glorious capture - the colors and composition are fantastic. fantastic composition and absolut cool processing. the processing is perfect, and the brightness is very appealing and captivating! What a unique city shot this makes . . and your toning suits it to perfection. So vivid and alive, I can almost see the tulips swaying! This is beautiful! The color of the tulips, the architecture of the building and I like the reflection in the windows. Great processing! Beautiful composition, Steven, with superb processing. Love the combination of architecture and gardens. Great colors, I love the reflections in the windows. I see what you mean about the entablature (a new word for me - thanks for the wiki link...duhhh) it is quite uniqu and intricate. ASsfor this lovely image, it is a wonderful blend of nature's colorful plants and structural beauty. Looking upwards from the tulips to the trees and buildings beyond, everything seems to fall so beautifully in place becasue of your perspective here, Steven. This really sends off an energy here..very wonderful ! Great! The colors of the tulips are so bright! Amazing shot and treatment ! absolutely stunning, both the colors and the compo! That is a super image. The Cultural Center caught my eye right away. It's beautiful as are tulips. I like the photo frame up.. not sure I will ever like hdr flowers though.. it takes the softness out. No offence, your photography is always superbly done.